Approximate seating for buffet style dinner: 450-500. How far in advance do we need to book our wedding? Generally a year in advance as weekends do book up quickly. How soon can we get in to decorate and when do we have to be out by? Usually you can start decorating the Tuesday prior to your event and cleaned up by the Monday after. Can our guests camp overnight at the park? Yes, we have camping spots available in various places at the park. If they hook up to electric and water there is an additional $30 fee per campsite. Otherwise, it's $5/person per night. We have heat but no air conditioning. However, there are two exhaust fans on each end of the building and the windows do open. Do you provide beverage service and do we have to buy our liquor and beer through you? We have a box soda machine available for rent for $150. It comes with cola, diet cola, lemon-lime, diet lemon-lime, lemonade, cranberry and sour. Product brand depends on the distributor and can vary from Coke to an off-brand such as RC Cola. We do not swap out soda on the machine and the brand type is solely at the discretion of our distributor. We can provide liquor and beer if you plan to charge for drinks. Otherwise we prefer you bring in your own. Do we need a licensed bartender? Do you provide them? Yes, you need to have a bartender licensed in the Village of Rosholt. We do not provide bartenders. How is your bar setup? We have an indoor bar that can be moved if necessary. However, you would need to move it on your own and put it back in place before leaving. The bar is about 20'x20' in a square shape. Some groups have also chosen to rent the LCK Food Stand that is located outside the front door for serving. Ice is available depending on the weather. We have 20lb bags of ice for $5/bag. Please check with us to find out availability. Can we use the outside lights? Yes, we have plenty of outside lights that you can turn on as needed. Each pole has three lights that can be turned on individually depending on how much light you need. Can we utilize the outside picnic tables? Yes, but please return them when done. What are your power capabilities for Nescos, a band or DJ, etc? The northeast corner of the building has multiple separate circuits in a long strip along the wall. Each duplex outlet is one circuit. Additional gray outlets are available along the upper beams. These are dedicated 20amps each. The stage has 100amps available for bands or a DJ. Carefully... You can either take your garbage with you or you can use our services through Harters. Hand carts are available for $15 each or you can rent the 2-yard dumpsters at $75 each. Hand carts should be lined up on the north side of the road in front of the Exhibit Building for easy pickup. Erin and Carol Wierzba (715) 341-8281 cell (715) 321-1825. Note: Third party vendors are listed as a reference not an endorsement. 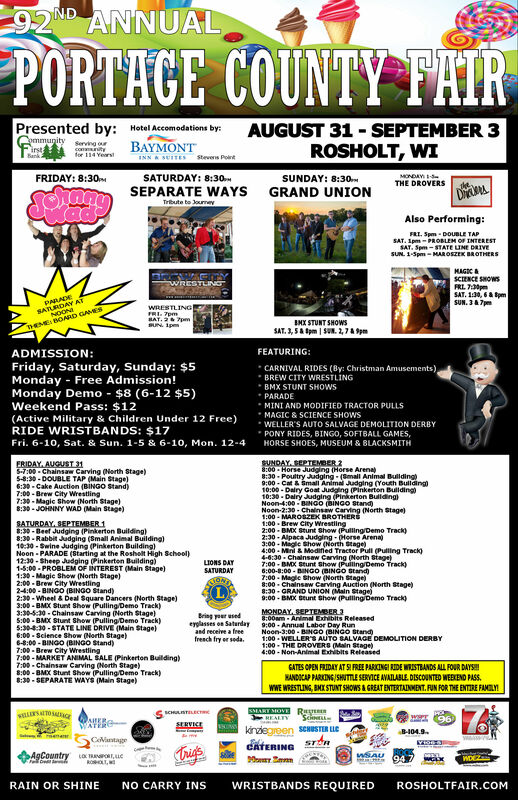 If you’d like to be listed please contact us at info@rosholtfair.com.